Another Chinese New Year is upon us. This is the year of the lamb, according to 12-year cycle Chinese zodiac. Just as Christmas decorations are characterized by the colors red and green, Chinese new year decorations are predominated by red and gold. Red is the color of cheer and happiness, and gold symbolizes prosperity. 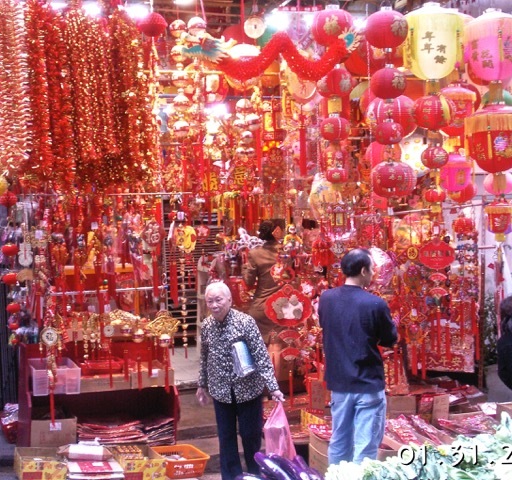 This Hong Kong store sold red and gold decorations for the Chinese new year. The popular Chinese new year greeting of Gong Hei Fat Choy (恭喜發財) means “wishing you prosperity”. Some homes objectify this greeting by displaying gold-colored plastic ingots. 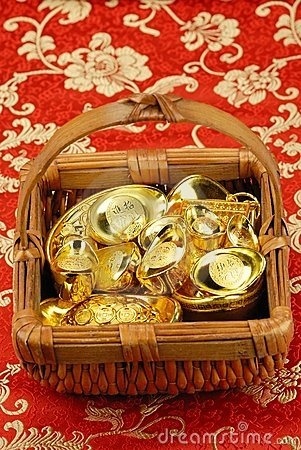 With the current price of gold, this basketful of gold, if real, would be worth a good fortune. I decided to use my ceramics skills to make our own gold ingot display for this year’s decoration. 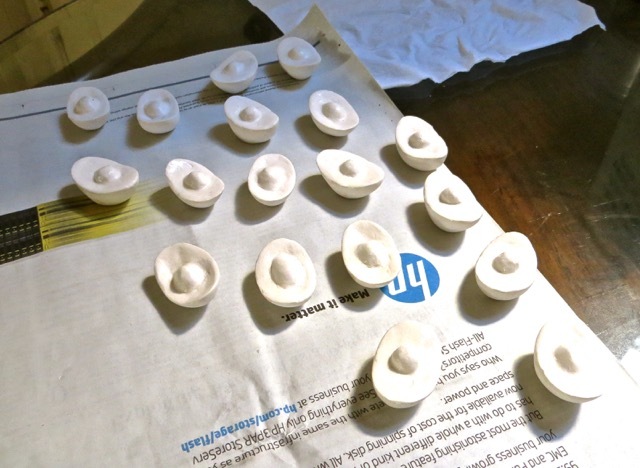 I sculpted 18 ceramic ingots. 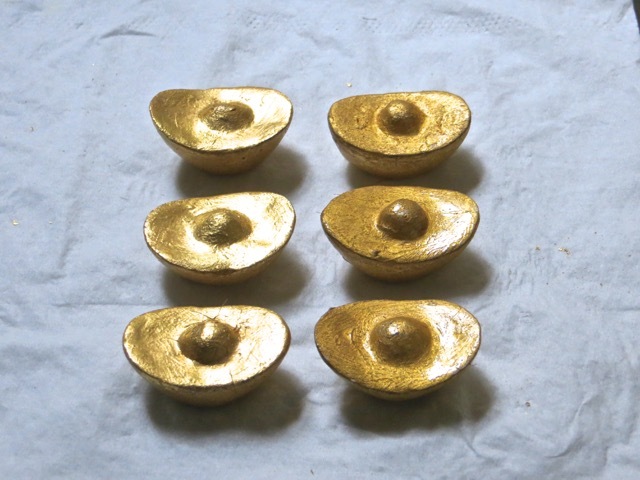 After the ingots were fired into brick-like bisques, I proceeded to gild them with gold leaves I bought in Myanmar. 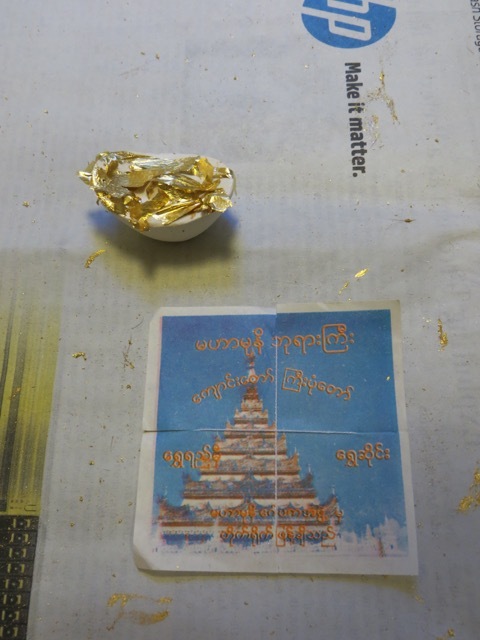 These gold leaves were sold to pilgrims who would gild Buddha statues as offerings. 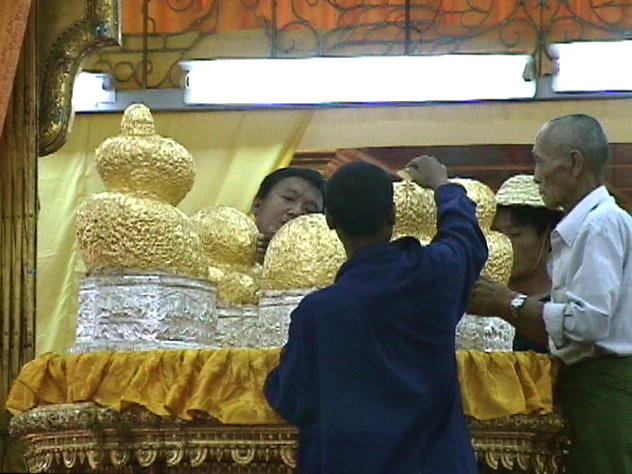 These statues in a temple in Myanmar have been gilded by so many layers of gold leaf they became indistinguishable globs of gold. The gold leaves are extremely thin, having been beaten by men for 7 hours into 0.000,005 inch (five-millionth of an inch) thick foils. Human hair, by comparison, is 0.004 inch (four-thousandth of an inch) thick. If I sneezed at it, the thin gold leaf would fly away. 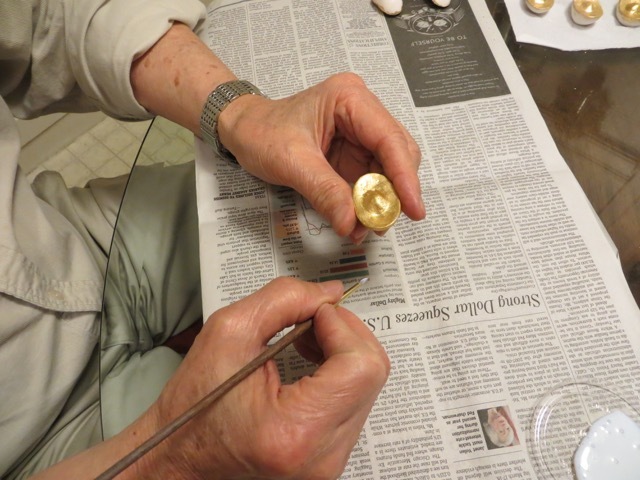 I painted the ceramic ingot pieces with a coating, then apply the foil to the half-dried, sticky coating. 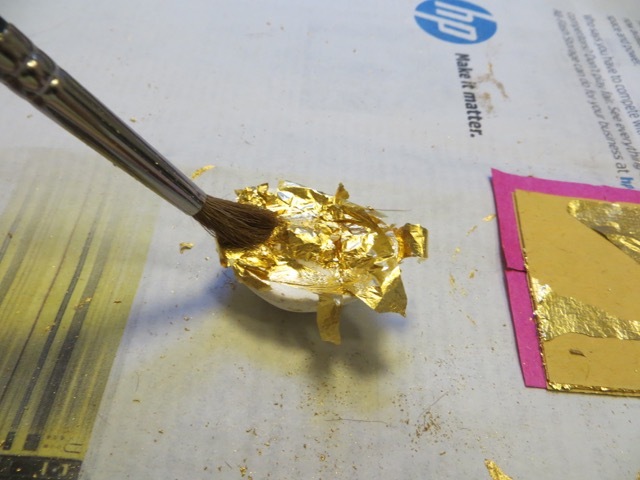 A brush would easily burnish the gold leaves to conform to the underlying surface. 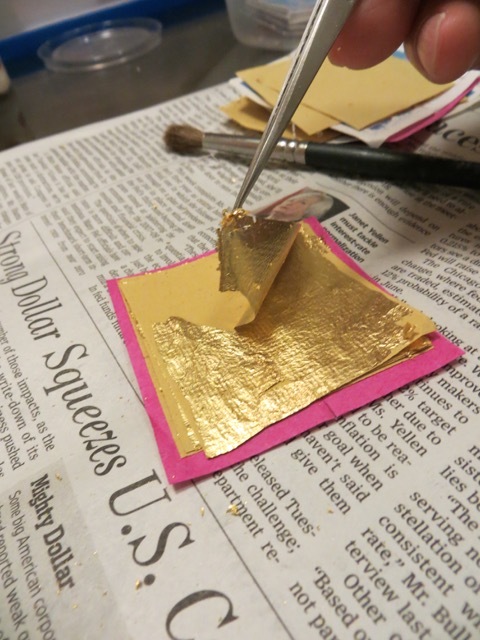 After gilding, I sprayed the gilded ingots with a clear coating to protect the surface. This was a mistake. 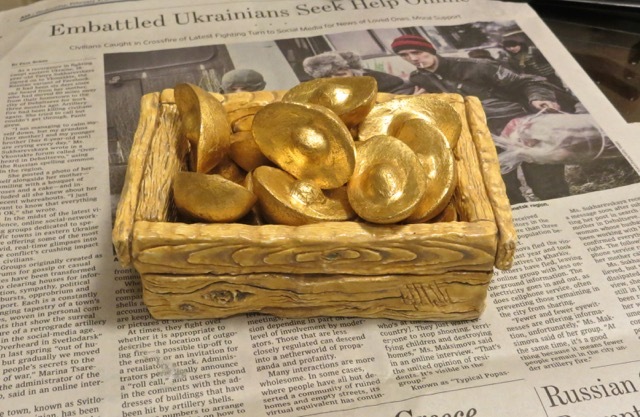 The clear coating altered the gleaming, sparkling gold ingots and covered them with dull, unappealing gold-colored paint. I had to gild the ingots a second time to regain the sparkle of 24K gold. 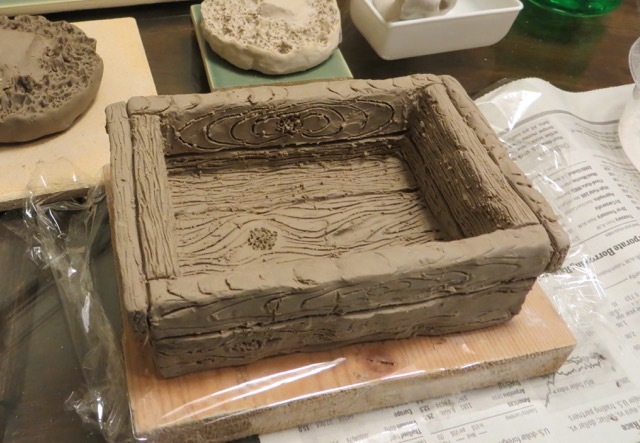 Separately, the ceramic wooden box was carefully decorated with wood grains. I intended the box to have the light brown color of weathered wood. But after the glaze firing, the box appeared as golden colored. It competed with the gold ingots and obscured the gilded gold pieces. This is a common risk as it is difficult to predict how underglaze colors would turn out after firing in the hot kiln. 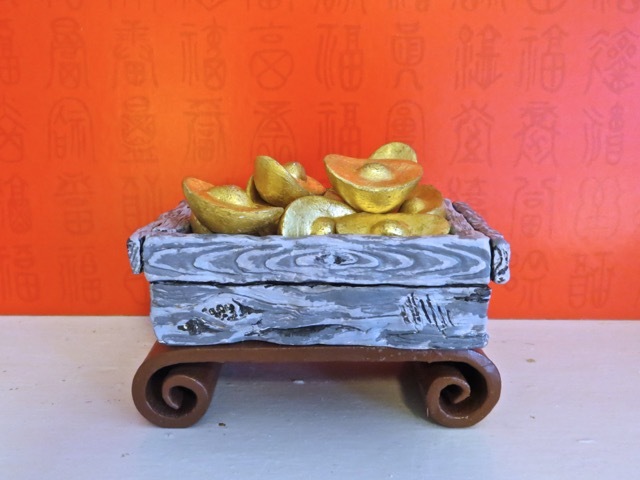 To highlight the gilded gold ingots, I painted the wooden box with acrylic paints. Now I have a nice display for the Chinese new year. Gong Hei Fat Choy 恭喜發財 to you all. Posted by Robert Wu on Sunday, February 15, 2015, at 4:58 pm. Filed under Uncategorized. Follow any responses to this post with its comments RSS feed. You can post a comment or trackback from your blog.